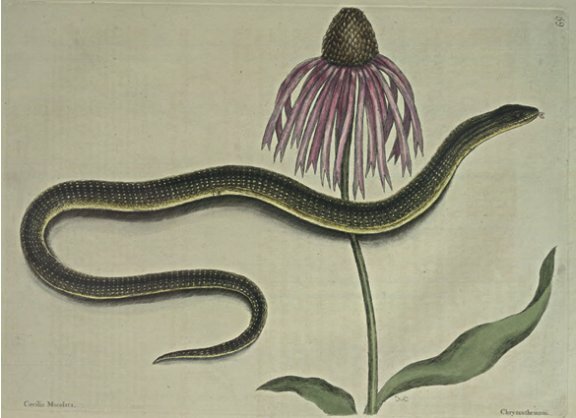 The Head of this Snake is very small, the Tongue of a singular Form, as in the Figure is represented: They are of various Sizes, most of them are less than the Figure, the upper Part of the Body is of a Colour blended Brown and Green, most regularly and elegantly spotted with yellow, the Belly yellow, the under most Part of which is brightest. Their Skin is very smooth, and shining with smaller Scales, more closely connected, and of a different Structure from other Serpents; A small Blow with a Stick will cause the Body to separate, not only at the Place struck, but at two or three other Places; the Muscles being articulated in a singular Manner quite through to the Vertebra. they are generally said to be harmless, They appear earlier in the Spring than any other Serpent, and are numerous in the sandy Woods of Virginia and Carolina. This Plant usually rises about six Feet from the Ground, with several large Stalks, producing on their Tops the first blown and largeft Flowers, succeeded by many smaller ones from the side Branches; it continues flowering at least three Months: The Leaves grow alternately along the Stalks, resembling in Form and Manner of growing those of a Tulip. The Flower is of a Peach Colour, crowned with a very large scaly Cone or Seed Vessel, from the Basis of which proceeds the Petals of the Flower hanging round it, in Form of an Umbrella. The Petals are narrow, four Inches long, and deeply notched at their Ends: They grow on the Banks of the Savanna River, about five hundred Miles from the Mouth of it. We have had it flower in England, but it is now lost.